Japan has the amazing beauty of nature and a four-season climate that reflects the country’s geography. As a volcanic country that locates to the east end of the Eurasian continent and faces the Japan Trench and Pacific Ocean, Japan has also experienced a large number of natural disasters. Over a long period of history, people in Japan have experienced and overcome earthquakes, tsunami, typhoons, volcanic eruptions, and floods, among many other disasters, and have prepared for future disasters. This long history of natural disasters has affected the way people perceive the world and life, and created the concept of impermanence. On March 11, 2011, at 2:46 p.m. local time, a magnitude-9.0 earthquake developed off the coast of Miyagi Prefecture. The huge tsunami generated by the earthquake hit the coast of Tohoku and other East Japan areas and caused serious human and material damage. The Great East Japan Earthquake induced a serious accident at the Tokyo Electric Power Company Fukushima Daiichi Nuclear Power Plant, causing widespread radioactive contamination. Since the disaster occurred in winter, people living in coastal areas lost their houses and stayed in evacuation centers and temporary housing, and public utilities were severely damaged in Tohoku and other East Japan areas, causing people to experience severe mental and physical stress as well as health problems. Tohoku University Hospital, located in the center of the area affected by the disaster, worked with other medical institutions, governments, and medical associations to provide disaster medical care in full force. The author and his colleagues provided cardiovascular care during disasters, and learned a lot from the experience. The cardiovascular system is the most vulnerable of all body systems to stress, and appropriate acute phase treatment is especially important for the treatment of cardiovascular diseases. Large-scale earthquakes such as the Great Hanshin-Awaji Earthquake on January 17, 1995 and the Niigata-ken-Chuetsu Earthquake on October 23, 2004 have been associated with increased incidences of cardiovascular diseases. Reports have described that cases of acute coronary syndrome and takotsubo cardiomyopathy increased in association with the 7.3-magnitude Great Hanshin-Awaji Earthquake1,2 and those of pulmonary embolism and acute coronary syndrome increased in association with the 6.8-magnitude Niigata-ken-Chuetsu Earthquake.3,4 These two earthquakes occurred directly beneath the cities, and the affected areas were relatively small in size. On the other hand, the Great East Japan Earthquake was a trench-type earthquake that induced tsunami, which caused a substantial part of the human and material damage in a wide area. The authors conducted a number of surveys to investigate the effect of the Great East Japan Earthquake on the prevalence of cardiovascular diseases, and reported that the disaster was associated with increased incidence of heart failure and ventricular arrhythmia, in addition to those of acute coronary syndrome and pulmonary embolism which were reported after the Great Hanshin-Awaji and Niigata-ken-Chuetsu Earthquakes, and that people became more prone to coronary spasm.5–8 The increased incidence of heart failure had not been reported in previous studies on earthquake-related health problems, but was confirmed in additional surveys in other prefectures affected such as Iwate and Fukushima Prefectures. These findings suggest that the profile of cardiovascular diseases that would be more prevalent among people affected by large-scale earthquakes may differ by type of earthquake (inland vs. trench-type earthquakes), time of occurrence, or the size of the affected area. As it is highly likely that Japan will experience a Nankai Trough earthquake (trench-type) or a Tokyo Inland earthquake in the near future, Japan should prepare for these future disasters to ensure appropriate health care and other needed services during emergencies. Natural disasters will occur inevitably, but we can reduce damage caused by them. The concept of disaster reduction is important. The Japanese Circulation Society, the Japanese Society of Hypertension, and the Japanese College of Cardiology have decided to prepare guidelines for disaster medicine for patients with cardiovascular diseases. Clinicians and researchers who actually provided medical care in areas affected by natural disasters were requested to write guidelines that include general principles and practical application for providing cardiovascular care during disasters as well as preventing disaster-associated cardiovascular diseases. The joint committee expresses its sincere gratitude to the authors of these guidelines. We hope the guidelines will facilitate cardiovascular care during disasters in the future. The Japanese Circulation Society (JCS) has prepared and published its guidelines for the management of typical patients with the relevant cardiovascular diseases in the common medical setting according to the style used in the American College of Cardiology/American Heart Association (ACC/AHA) guidelines. JCS guidelines have been written according to literature review of the results of multi-center, randomized, prospective clinical studies, and recommendations on diagnostic and treatment procedures are classified in terms of the level of evidence (from Level A to C) and the strength of recommendations (from Class I to III). However, as the present guideline document describes how to provide cardiovascular care in unusual conditions such as natural disasters, it is very difficult to provide recommendations of evidence-based medicine on the basis of randomized prospective clinical studies as in other treatment guidelines in the usual clinical setting. It has been suggested that the profile of disaster-associated cardiovascular diseases may differ by type of earthquake (inland vs. trench-type earthquakes), time of occurrence, or the size of the affected area. Accordingly, the level of evidence and the strength of recommendations are indicated only for recommendations based on literature review. Class I: There is evidence and/or general agreement that a given methods of evaluation or treatment is useful and/or effective. Class II: There is conflicting evidence and/or a divergence of opinion about the usefulness/efficacy of a given methods of evaluation or treatment. Class IIa: Weight of evidence and data and opinion is in favor of usefulness and/or effectiveness. Class IIb: Usefulness or effectiveness is less well established by opinion. Class III: There is evidence and/or general agreement that the methods of evaluation or treatment is not effective and/or useful or may even be harmful and is not indicated. Level A: Demonstrated with multiple multi-center randomized, controlled studies in ≥400 patients or meta-analyses. Level B: Demonstrated with multi-center randomized, controlled studies in ≤400 patients, well-designed comparative studies, or large-scale cohort studies. Level C: Only consensus opinion of experts, without data of randomized, controlled studies. The present guideline document summarizes the experiences on disaster-related cardiovascular diseases during large-scale disasters, including the Great East Japan Earthquake, and the current policies and opinions shared by specialists who actually served medical care in areas affected by large-scale earthquakes. This document also contains suggestions for cardiologists who should prepare for large-scale earthquakes in the future. Guidelines provided in this document should be revised periodically to eliminate personal biases and reflect updates. The reader is encouraged to utilize the guidelines and provide feedback. On March 11, 2011, a magnitude-9.0 earthquake occurred, and caused serious human and material damage in east Japan, mainly the Tohoku area. After the earthquake and tsunami, more than 450 thousand people had to stay in evacuation centers. Many of them lived there for a long period of time. The significant change in the living environment and mental and physical stress due to sleep disorder or other factors were believed to be associated with diverse cardiovascular diseases (Figure 1). Mechanisms for increased incidence of cardiovascular diseases in the event of an earthquake. Earthquakes induce acute and chronic stress that activate the sympathetic nervous system and thereby induce diverse disorders. RAA, renin-angiotensin-aldosterone system. After the occurrence of the Great East Japan Earthquake, the incidence of acute coronary syndrome, which includes acute myocardial infarction and unstable angina, increased significantly in the affected areas.5 The number of sudden cardiac deaths increased shortly after the occurrence of the 1994 Northridge earthquake that hit the greater Los Angeles area, California,9 and many of these deaths were considered attributable to myocardial infarction. The increased incidence of acute coronary syndrome including myocardial infarction after disasters may be explained that physical and mental stress played as a trigger in people with atherosclerotic lesions. There had been no studies demonstrating an increased incidence of heart failure in association with earthquakes, but after the Great East Japan Earthquake in 2011, an increase in cases of heart failure was reported for the first time.5 It is believed that heart failure newly developed or became exacerbated due to the interactions of multiple factors such as activation of the sympathetic nervous system induced by disaster-related stress, which causes increased blood pressure and arrhythmias in the presence of additional risk factors such as shortage of medicine, increased salt intake due to relying on preserved food, low room temperature, and pneumonia and other infections. The relationship between the increased incidence of deep vein thrombosis (DVT) and pulmonary embolism and an earthquake was first reported among people affected by the 2004 Niigata-ken-Chuetsu Earthquake.4 DVT developed mainly among people who sat in the car in the same posture for long periods of time during evacuation. It has been reported that the incidence of cerebral hemorrhage increased after the Noto Peninsula Earthquake in March 2007.11 It is believed that the elevation of blood pressure associated with the disaster played a role in the pathogenesis of cerebral hemorrhage. After the Great East Japan Earthquake, cases of stroke including cerebral infarction and hemorrhage increased sharply.5 Increased incidence of hypertension and arrhythmias are suggested to trigger stroke. On the day of the 1994 Northridge Earthquake (Los Angeles, USA), there was a sharp increase in the number of sudden deaths from cardiac causes.9 The data suggest that the early morning earthquake caused severe mental stress, which triggered sudden death. Respiratory infections are not cardiovascular diseases but are included in this section as they may worsen heart failure. After the 1995 Great Hanshin-Awaji Earthquake, there were increased cases of respiratory diseases including pneumonia and bronchial asthma.12 The 2011 Great East Japan Earthquake caused substantial damage due to the tsunami, and aspiration pneumonia developed among tsunami victims who aspirated water during near drowning.13 It is believed that the crowded living conditions in evacuation centers was a cause of increased incidence of infections among disaster victims. Stress is a defense mechanism for the human body, but may exert detrimental effects on organs. Little is known about how acute stress causes cardiovascular disorders. Findings from many observational studies indicate that acute stress may cause cardiovascular disorders by inducing (1) enhanced sympathetic nervous activity or autonomic imbalance,17,18 (2) hypercoagulability,19 or (3) abnormal vascular reactivity, myocardial ischemia, or induction of microcirculatory disorder.20,21 Circadian rhythm,22–24 climate,25,26 and gender2,9 modify the risk of cardiovascular disorders due to acute stress. During the acute phase of a disaster, physical stress (e.g., coldness, noise, and radiation), biological stress (e.g., inflammation, infection, and starvation), chemical stress (e.g., pollution, oxygen, and chemical substances), and mental stress (e.g., sadness, anger, and anxiety) interact with each other, and affect the body. On the other hand, mental stress is considered to become dominant during the chronic phase of a disaster (Figure 2). 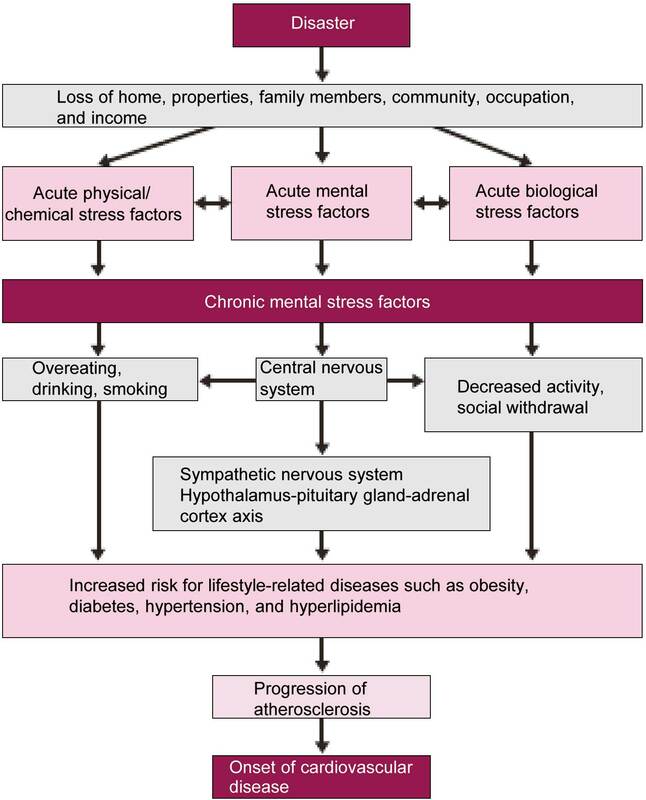 A hypothesis on the relationship between chronic stress following a natural disaster and the onset of cardiovascular diseases. Sudden loss of home and family members causes acute stress reactions such as mental stress, physical/chemical stress (e.g., coldness and pollution), and biological stress (e.g., infections and starvation). These stresses interact with each other, and mental stress becomes dominant during the chronic phase. Mental stress factors affect the central nervous system, including not only the hypothalamus-pituitary gland-adrenal cortex axis but also behavioral patterns (e.g., overeating, drinking, and decreased activity). These factors may negatively affect lifestyle-related risk factors for atherosclerosis, which may increase the likelihood of cardiovascular diseases. Mental stress factors are delivered into the amygdala and the hypothalamus in the central nervous system as sensory information, recognized in the cerebral cortex where emotions and behavioral drives are produced. It is believed that stress response is mainly mediated by cortisol regulated in the hypothalamus-pituitary gland-adrenal cortex axis and by noradrenaline/adrenaline regulated in the sympathetic-adrenal medullary axis. Persistent cortisol excess may induce central obesity, decreased glucose tolerance, dyslipidemia, or volume-dependent hypertension, and persistent sympathetic hyperactivity may increase the risk of cardiovascular diseases by inducing increased heart rate, hypertension due to peripheral vasoconstriction, cardiac myocyte hypertrophy or arrhythmogenic effect. Persistent mental stress may induce overeating, unhealthy lifestyles such as excessive drinking and smoking,27 and thereby leads to decreased physical activity (disuse syndrome) or social withdrawal in the evacuation center or temporary housing. Disasters may increase the risk of cardiovascular diseases by worsening and persisting risk factors for lifestyle-related diseases and thereby promoting the progression of atherosclerosis (Figure 2). The environment of an evacuation center depends on the severity of disaster damage, availability of public utilities, features of the facility used as the evacuation center, and the number of refugees in the facility. It is thus effective to assess the environment of the evacuation center promptly after starting use to improve the environment of the center. Assessment may reveal problems and needs in the center, and prompt interventions to solve them will improve the environment dramatically. Keeping a proper environment for refugees is an important measure to prevent infections as well as respiratory and cardiovascular diseases that are major causes of disaster-related deaths. Disaster-related deaths may be prevented by understanding the minimal requirements for the living environment at evacuation centers and identifying and improving problems without delay. Recommendations for how to ensure food supply and eat safely during the acute phase of a disaster have been prepared according to the experience from the Niigata-ken-Chuetsu Earthquake and the Great Hanshin-Awaji Earthquake, and published as the basic28 and advanced29 editions of the “Niigata Prefecture guidelines for nutrition and food support during disasters”, the “Guidelines for dietary and food during disasters” by Hyogo Prefecture,30 and the “Disaster control guidelines for mothers and young children” by Tokyo.31 The National Institute of Health and Nutrition provides links to these guidelines (http://www0.nih.go.jp/eiken/info/saigai_syoku1.html). These guidelines describe the importance of proper food storage to prepare for disasters, and how dietitians working for local government agencies should work together with relevant divisions and functions to provide dietary support and serve meals to victims in different phases after disasters (Table),29 and instructions to the general public on how to cook and eat safely during disasters. Disasters cause a shortage of clean drinking water. Floods and tsunami may damage foods, and electricity outage and destruction of storage facilities may cause food rot, which cause infections and food poisoning. The Emergency Preparedness and Response published by the United States Centers for Disease Control and Prevention (CDC)32 should be referred to on how to prevent infections during disasters. Some disaster victims/refugees may experience worsening or progression of chronic diseases such as diabetes, hypertension, rheumatoid arthritis, and obstructive pulmonary disease even during the chronic phase of (several months to 1 year after) a disaster.37 Individual victims need not only treatment for the disease, but also measures to eliminate the exacerbating factors such as hygienic conditions (e.g., the dust produced by the debris), economic difficulties, living conditions that hinder appropriate room temperature, rest, sleep and relaxation, poor access to healthcare (e.g., adherence to drug treatment and clinic visits), nutritional problems (e.g., overeating, undereating, nutritional imbalance, and excessive alcohol consumption), physical factors such as chronic fatigue and reduced physical activity, and mental factors such as feeling of desperation, anxiety about the future, and stress. One of the most significant health problems among disaster victims is insomnia associated with the disaster itself, loss experience, or stress due to environmental change. Insomnia may also represent as adjustment sleep disorder (acute insomnia) or be associated with depression, post-traumatic stress disorder (PTSD), or other mental disorders. Insomnia among disaster victims is also caused by fear of sleep, change in living/sleeping environment during evacuation, increased activity at night, chronic pain due to physical disorders, skin itching due to poor hygiene, or frequent urination due to cold weather or cystitis. Adjustment sleep disorder may be induced by mental, physiological, physical, or environmental stress factors. Diverse stress factors including loss of property, loss of family or friends, evacuation to an unfamiliar place, and change in human relationships may prolong sleep latency, increase the number of awakenings and wake time after the disaster, and decrease total sleep time or the quality of sleep. Disaster victims are susceptible to insomnia as they have risk factors such as abrupt change in living environment, psychological trauma, and living in crowded evacuation centers. Healthcare professionals should express sympathy for disaster victims with difficult situations where insomnia may ineluctably develop, and explain that it may often disappear over time. However, some victims may need medical interventions such as sleep hygiene education and drug treatment as insomnia may decrease the physical and mental quality of life (QOL). In patients who have received antianxiety or hypnotic drugs at high doses for a long period of time, abrupt discontinuation of treatment may induce convulsions or insomnia. When the same drug is not available after the disaster, patients should be instructed to continue using the drug at a lower dose or take other measures to extend the duration of treatment as possible.39 Gradual dose reduction may decrease the incidence and severity of withdrawal symptoms. Non-pharmacological approaches should be prioritized for the treatment of new cases of insomnia, but appropriate drugs should be prescribed for those not responding to non-pharmacological treatment. However, hypnotic drugs should be the last resort for disaster victims as it has been reported that the incidence of DVT is high among disaster victims using hypnotic drugs.40,41 Ultra-short acting or short-acting hypnotics are suitable for patients with difficulty in initiating sleep, while intermediate- or long-acting hypnotics are suitable for patients having difficulty in maintaining sleep, including those with nocturnal awakenings or early morning awakenings (Level of Evidence: C). The concomitant use of hypnotics and alcohol must be avoided. Patients with anxiety disorder tend to have difficulty in initiating sleep, while patients with depression tend to suffer from difficulty in maintaining sleep such as nocturnal or early morning awakenings. - After a large-scale disaster, people are exposed to substantial stress and environmental risk factors, which may induce an increase in blood pressure, a thrombophilic state or hypercoagulable state, and thereby cause diverse cardiovascular diseases. Discontinuation or inappropriate administration of antihypertensive, antithrombotic or antianginal drugs to cardiovascular patients may worsen their existing condition. - When prescription information is unknown or usually prescribed drugs are unavailable, cardiovascular patients should be treated with alternative drugs with long-established efficacy and a low risk of adverse events. - The management and use of cardiovascular drugs in places affected by disasters require expertise. Physicians should work closely with pharmacists to provide disaster medical service. When a large-scale disaster occurs, it is important to obtain data on health status, morbidity, and mortality of disaster victims promptly and efficiently. However, it is often difficult to collect health data after a large-scale disaster. Treatment of injuries and infections are prioritized, especially in the acute phase of disaster, and data on cardiovascular diseases cannot be collected. (1) Mortality statistics and ambulance transport data cannot be used in a timely manner as these data are collected and tabulated by the relevant local government agency before publication; (2) the exact number for the denominator cannot be obtained after a large-scale disaster like the Great East Japan Earthquake when victims moved out the affected area temporally or people living in the evacuation zone surrounding the Fukushima Daiichi Nuclear Power Plant relocated to other places without changing their residential registration according to the special act for nuclear refugees; (3) as data do not contain personally identifiable information, individual risk factors such as the extent of disaster damage, lifestyle, and past illness cannot be considered in the analysis. Data containing analyzable individual characteristics should be obtained in order to effectively accumulate and share disaster data without delay and prevent secondary health hazards. The local and national governments agency should establish measures to promptly, effectively collect and share health data after a large-scale disaster like the Great East Japan Earthquake. It is also necessary to establish information infrastructures such as cardiovascular disease management networks that allow physicians to register patient information, and use patient data after disasters by combining with disaster information. Appropriate information infrastructures would link usual medical practice with disaster medical service, and thereby facilitate medical and preventive interventions to disaster victims effectively. The prevention score is recorded as the number of items achieved for the disaster victim among (1) sleep improvement (S), (2) continuation of exercise (E), (3) good diet (D), (4) maintaining body weight (W), (5) infection control (I), (6) thrombosis prevention (T), (7) continuation of medication (M), and (8) blood pressure management (P). The score ranges from 0 to 8. A prevention score of ≥6 should be targeted in the relevant high-risk patients and in all people in the evacuation center. Disaster hypertension is defined as an increase in blood pressure to 140/90 mmHg or higher after the occurrence of a disaster.38,46,47 As disaster hypertension is a risk factor for disaster-related cardiovascular diseases, patients should be receive antihypertensive therapy. In Asians, the correlation between blood pressure and risk of cardiovascular diseases is particularly strong, and Asians are particularly prone to salt-induced hypertension.48 Blood pressure management is particularly important for disaster victims in Japan to prevent cardiovascular events. Blood pressure measurement is the first step in preventing disaster-related cardiovascular diseases. Blood pressure is a useful measure to detect disaster hypertension and assess the effect of disaster-related stress on the body and mind of victims. No clear evidence has been obtained regarding treatment goals and recommended drugs for the treatment of disaster hypertension. However, evidence obtained in non-disaster conditions and experience with disaster victims suggest that patients with a SBP of ≥160 mmHg should receive antihypertensive drugs to decrease the SBP to <140 mmHg.38,46,49 Blood pressure should be determined every other week to modify their antihypertensive treatment (Figure 7).38,46,49 Disaster hypertension that develops among previously normotensive victims may often disappear spontaneously as the environment improves. Accordingly, continuing antihypertensive therapy without close monitoring may lead to hypotension that may cause decreased daily activities or falls, or may increase the risk of cardiovascular events among high-risk individuals.49 Patients during antihypertensive therapy with a SBP of <120 mmHg should be observed carefully for hypotensive symptoms, and antihypertensive therapy should be discontinued at an appropriate timing, especially for patients who developed hypertension after the occurrence of a disaster. 1. Understand the types of pathogens that are prevalent in the affected areas. 2. Assess the risk of infections among people gathering at the evacuation center. 3. Assess the effects of the disaster on the living environment. 4. Assess the risk of interruption of public utilities including water, sewerage, and electricity. 5. Assess the risk due to shortage of food. 6. Assess the risk due to loss of medical services. Water-borne infectious diseases, such as diarrheal diseases classified into bacterial food poisoning, hepatitis A, hepatitis E, and leptospirosis, may occur. Influenza, norovirus infection, measles, tuberculosis, and Neisseria meningitidis infection may occur. There have been no reported cases of malaria infection in Japan. Appropriate measures against mites and chiggers should be taken to prevent vector-borne infections. Disaster victims have a greater risk of skin and soft tissue infection by common causative pathogens as well as that of tetanus. 1. Ensure hygiene in evacuation centers. 2. Conduct infection surveillance to detect the occurrence of an outbreak without delay. 3. Restore the basic functions of local medical institutions. 4. Try to eradicate mosquitoes and other vectors. It is unlikely that an outbreak of infectious diseases occurs due to inappropriate handling of dead bodies after a natural disaster. However, since there have been rare cases of cholera or viral hemorrhagic fever from contact with dead bodies, mortuary personnel should at least wear gloves to handle dead bodies with care and dispose used gloves appropriately. Disaster victims may suffer from not only injuries and physical damage, but also mental damage, which may cause diverse psychiatric symptoms. Immediately after the occurrence of a disaster, people are surprised by experiencing earthquakes and the heat from fires, and are in shock at the sight of blood and death, which can cause psychological disturbance. After months or years, these memories may come back to disaster victims vividly as if they are having the same experience again. Disaster victims may often have great sorrow and grief reactions to the loss of their family members, assets, and livelihood.51,52 After their first response to the disaster, victims face significant changes in their lives and have anxiety for their life in the future, which increases the level of mental stress associated with their daily activities. Excessive mental stress may cause suicide, accidents, increases in alcohol consumption and smoking, conflicts with family or community, and delay in return to normal life. Some people may exhibit deviant behaviors. People are prone to anxiety or depression during this phase. Stress may exacerbate existing physical diseases and cause new diseases. Mental healthcare professionals should screen disaster victims appropriately to identify those who seem to have severe mental problems and need mental health support. During screening and monitoring, personal privacy should be protected. As mental health symptoms become more persistent after a certain period of time from the occurrence of a disaster, it is desirable that disaster victims be screened for mental health problems whenever necessary. As a rough indication, victims should be screened at week 5 or later after the occurrence of the disaster. Mental health screening should be conducted to identify individuals at risk for mental disorders on the basis of the severity of mental health problems and the effects of the disaster on their family members and community, obtain information that will facilitate further support, and refer those appearing to have more severe mental health problems to psychiatrists first.51 Mental health diagnosis is not always necessary during screening. It is assumed that disaster victims have significant mental stress during the period from the chaotic phase immediately after the occurrence of a disaster through the stabilized phase. In order to prevent excessive mental stress during the chaotic phase, preparation for future disasters is necessary to ensure that healthcare professionals provide prompt and consistent medical services that are covered with the National Health Insurance from immediately after the occurrence of a disaster.57 Disaster preparedness should include (1) establishing disaster response coordination systems, (2) securing supporting systems including logistics, and (3) stockpiling resources. Immediately after the occurrence of a disaster, healthcare professionals should focus on triage to provide optimal medical services with available resources, as well as on securing food and water among other necessities, medical and human resources, and logistic support and grasping the extent and severity of the disaster. Several days after the occurrence of a disaster, medical problems due to poor living environment become prevalent.5 Specifically, living with others at crowded evacuation centers may cause fatigue, poor health conditions, infections, and exacerbation of existing diseases, and discontinuing treatment may cause acute exacerbation of existing chronic conditions. Mental health care is also necessary for the treatment of psychological trauma due to the disaster. Healthcare professionals should listen to disaster victims carefully and receptively.57 Stress management is important not only for patients but also for healthcare professionals. Chronic stress due to death of family members and change in living environment, including staying at evacuation centers, may exacerbate multiple risk factors for atherosclerosis. 1. These risk factors should be managed carefully through lifestyle interventions, drug treatment, or other appropriate measures. 2. Psychological care may be effective for high-risk disaster victims under chronic stress, such as those with a history of myocardial infarction. 3. Automated external defibrillators (AEDs) should be available in places where many people gather, and the public should be educated on how to use AEDs and conduct cardiopulmonary resuscitation. It is believed that influenza vaccination may reduce the risk of myocardial infarction and stroke. 4. The public should be educated to avoid behaviors and habits that are known to induce cardiovascular events, for example, conflicts with family or neighbors, going out or working in very cold or hot weather, and excessive salt and fat in the diet. 5. It is likely that the preferential prescription of beta-blockers may be effective in reducing the risk of cardiovascular events in high-risk patients in the chronic phase of disaster.17 Regular use of oral aspirin and having nitrates available for use are considered effective as well. In order to prevent the unavailability of medical services during disasters, disaster medical systems should be established in advance to provide medical services continuously from the occurrence of disaster through long-term recovery. Figure 8 illustrates the MHLW’s concept on medical services from the acute to mid- and chronic phase of a disaster that has been developed based on the experience with the Great East Japan Earthquake.59 National and local governments and medical institutions throughout the country should follow this concept in order to be able to respond to disasters promptly, secure and dispatch healthcare professionals to the affected areas, and provide medical services to those who need them. During the first 48 hours after the occurrence of a disaster (ultra-acute phase), the Disaster Medical Assistance Team (DMAT) will lead disaster mitigation activities. During the following 5 days (the transition phase), healthcare professionals who provide necessary medical services in the affected areas should be dispatched by the Japan Medical Association (Japan Medical Association Team, JMAT), university hospitals, Red-Cross hospitals, national hospital organizations, the Japan Hospital Association, the All Japan Hospital Association, the Japan Dental Association, the Japan Pharmaceutical Association, and the Japan Nursing Association, among other groups. The groups involved in the transition phase will work together with the Disaster Victims Health Support Liaison Council and other relevant groups to continue mid- and long-term medical services. Disaster medical services are provided at medical institutions, disaster sites, and evacuation centers. 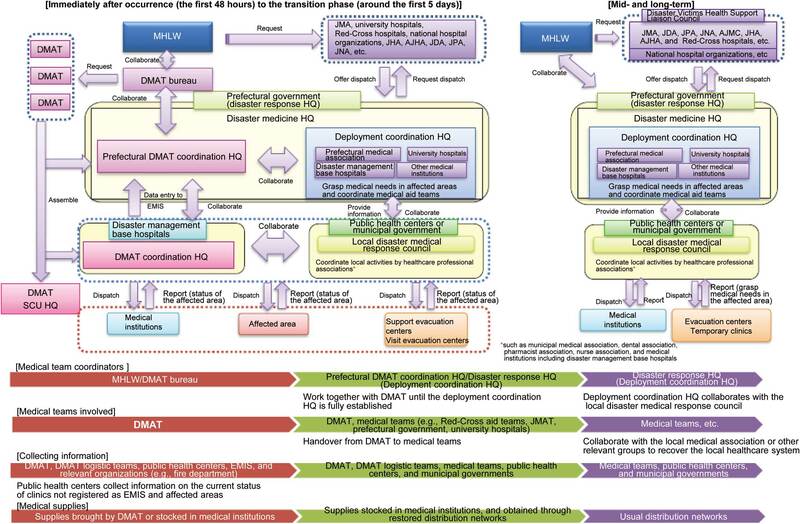 Those at disaster sites are provided during the ultra-acute phase by the DMAT. Medical services at evacuation centers are aimed to manage chronic diseases and prevent complications. Those who need acute medical care should be treated in medical institutions. Disaster management base hospitals will play a central role in providing acute medical care during disasters. In order to serve as the hub of disaster medical services, the disaster management base hospitals should have earthquake-resistant buildings and public utility services (i.e., telecommunication, electricity, and water); keep stockpiles of food, drinking water, and drugs for at least 3 days; and have a heliport which facilitates patient transportation by air ambulance. When a large-scale disaster occurs, advanced medical services will be unavailable in many hospitals in the severely affected areas as buildings will collapse and utilities will be disrupted, which makes it difficult for local healthcare professionals to keep the usual level of medical care. It is essential to ensure that less-affected hospitals accept victims who need advanced medical care and establish patient transportation systems. Medical institutions should establish networks that facilitate communication between affected and less-affected hospitals to share information and send patients without delay. Medical institutions that may accept disaster victims should provide detailed information on geographical features as well as available medical services. As the temporary headquarters of patient triage to classify patients into those transferred to local hospitals and those to hospitals in intact areas, staging care units (SCUs) should be placed to ensure prompt transportation of disaster victims requiring emergency medical care. In order to provide disaster medical services promptly, it is essential to establish systems to ensure quick and smooth transportation of patients from the disaster-affected areas to medical institutions in less-affected or intact areas. Patients with cardiovascular diseases often take drugs for a long period of time, and discontinuation of treatment may worsen their condition or result in a fatal outcome. When the Great East Japan Earthquake occurred, the tsunami destroyed buildings and flushed away medical records at clinics, prescription records and stock drugs at pharmacies, and medication booklets (“Okusuri Techo”) and prescribed drugs at houses, causing difficulties for many patients with chronic diseases, including cardiovascular diseases, to receive continued treatment. It has been suggested that the disruption of clinical practice was a major factor causing the increased incidence of heart failure, acute coronary syndrome, and stroke after the occurrence of the Great East Japan Earthquake.5 On the other hand, disaster victims who needed medical services after the occurrence of the 1995 Great Hanshin-Awaji Earthquake were mainly those who were trapped under the debris and needed surgical management, and no significant increase in cardiovascular events was noticed. As indicated with these two major earthquakes which differ in terms of the type of treatment required, medical services required by disaster victims may differ substantially depending on the type and extent of damage, and disaster medical needs are diverse, ranging from surgical treatment of disaster-related injuries to maintaining drug treatment in patients with chronic diseases. The followings are recommendations in terms of storing prescription data and stock drugs, and ensuring distribution of drugs, which were learned from the Great East Japan Earthquake. - As discontinuing drug treatment during disaster together with disaster-related stress may raise the risk of cardiovascular events, approaches to ensure continued drug treatment after the occurrence of a disaster should be established at different levels including local government, medical institution, and individual. - As patients’ medication booklets, which contain information on prescribed drugs to the patient, will facilitate physicians to make precise diagnosis and prescribe appropriate drugs even at the time of a disaster, patients should be educated to keep their medication booklet current and carry it with them. - In order to prevent interruption of drug treatment at the time of a disaster, patients who are taking drugs regularly should store one or two weeks’ worth of drugs. - Local pharmaceutical wholesalers associations should work with the relevant local governments, physicians associations, pharmacists associations, and the Japan Pharmaceutical Manufacturers Association to build systems to ensure drug delivery at the time of a disaster in order to provide all necessary drugs to the affected areas with no shortage or overage. Patients with cardiovascular diseases are increasingly treated in the home setting. Large-scale disasters may significantly affect home care patients because their medical devices may stop functioning due to a loss of electricity and other public utilities, and oxygen tanks and intravenous bags may become unavailable. The followings are recommendations in terms of disaster management and preparation for home care patients with cardiovascular diseases, which have been learned from large-scale disasters in the past. 1. Devices may stop working during a power outage. 2. Oxygen tanks and intravenous bags may become unavailable due to traffic damage. 3. The patient or family members may not know how to handle their devices or drugs in the case of an emergency. 4. Home medical devices may go wrong or break. The above measures are listed on the basis of reports on disaster response, but are not based on evidence. Additional information on the experience of disaster management for home care patients should be accumulated and accessed to improve these measures. These disaster response activities become feasible only when patients, medical institutions, relevant service providers, and local/national governments work together to prepare for disasters. 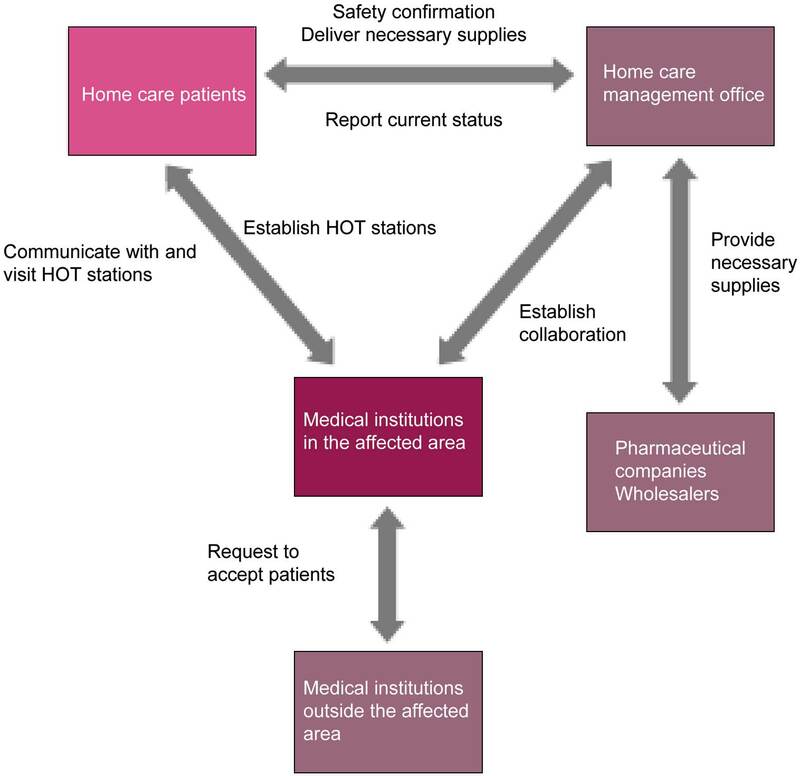 The authors hope that this guideline document will help these parties build a network system at disaster to support home care patients (Figure 9). Disaster support system for home care patients. HOT, home oxygen therapy. 1. Are meals provided regularly (three times a day) at appropriate times? 2. Is potassium supplemented with non-salt vegetable juice or other appropriate meals when fresh vegetables and fruits are not available? 3. Are low-salt meals served (e.g., reducing the portion size of pickled vegetables and soups) to respond to the disaster situation where salt sensitivity may be higher than usual? An increase in body weight after the onset of a disaster may be caused by excessive energy intake from carbohydrate-rich meals or by edema. Continued body weight reduction may represent malnutrition. Are water and sewerage available? Disaster victims should be encouraged to wash (or disinfect) their hands whenever possible and keep toilets hygienic. Disaster victims should drink at least 1L of water a day. Those who cannot eat sufficient quality and quantity of meals should be observed especially carefully to ensure adequate water intake. Patients receiving warfarin should not eat natto (fermented soybeans) or chlorella (algae supplement), and patients receiving calcium channel blockers should avoid grapefruit juice. Patients with renal diseases and high serum potassium levels should avoid potassium-rich foods such as raw vegetables, fruits (especially bananas, as one banana contains 400~500 mg potassium, which accounts for a third of the daily allowance for this patient population), and vegetable juice. Diabetic patients should monitor their body weight, and adjust meal size to avoid body weight gain. Patients should avoid excessive consumption of sugar-rich foods such as sweets and juices. Extra caution should be taken for diabetic patients receiving drug treatment in whom the time and frequency of meals may differ significantly before and after the occurrence of a disaster. Emergency meals commonly available have long shelf lives and are shelf stable, but some products do not have detailed nutrition labeling or may contain a large amount of salt. It is desirable that each household keep food materials that can be used for disaster relief but can also be used under usual circumstances and rotated to remove the older items first. The amount of salt in the product may be calculated from the sodium content on the label using the following equation. One gram of salt roughly corresponds to about 400 mg of sodium. Meals should be prepared using canned food and bottled/canned beverages. Whenever possible, meals should contain carbohydrates (steamed rice, rice porridge, bread, or noodles), protein-rich foods, and vegetables. Food in cans and retort pouches may be warmed with hot water. Soups may be prepared when water can be heated. The likelihood of infections depends on the living environment, hygiene, and availability of public utilities. In the event of a disaster, precautions should be taken to prevent outbreaks of infections, and infection surveillance should be performed in affected areas. Every possible measure should be taken to improve the living environment and hygiene using limited resources efficiently. When an outbreak occurs, the source and route of infection should be specified to avoid further expansion. The effect of infection control measures should be assessed periodically to improve the measures whenever necessary. Systematic infection control measures starting immediately after the occurrence of a disaster will facilitate the prevention of spreading infection. Diverse functions should work together to control infections. At the time of the Great East Japan Earthquake, the authors received valuable advice from infection specialists, and private entities helped obtain temporary lavatories. The prefectural government and the Self-Defense Forces helped set up hand-wash stations, and public health nurses helped educate disaster victims on how to ensure hygiene and provided suggestions to establish a good hygienic environment. In the event of a disaster, cooperation with various functions is more important than usual. Successful infection control depends on whether initial signs of an outbreak can be detected immediately and whether effective measures can be taken by cooperating with other functions. Traumatic stress experienced by disaster victims who have anxiety, fear, and loss experience stimulates the stress adaptation mechanism in the brain, which activates the sympathetic nervous system and the hypothalamo-pituitary-adrenal axis and thereby increases heart rate and peripheral vascular resistance in an early phase. Sleep disorders, including insomnia known as a cause of mental health disorders, were experienced by about 60% of affected people in the 1995 Great Hanshin-Awaji Earthquake, the September 11 attacks in 2001 in the USA, and the 2004 Indian Ocean earthquake and tsunami. Insomnia and increased blood pressure are often left untreated in the event of a large-scale disaster as healthcare professionals are occupied by emergency cases. However, prompt intervention should be made to treat people with these signs/symptoms of stress and mental health problems in order to prevent the occurrence of cardiovascular diseases. As researchers have suggested that one month after a disaster is a turning point for whether acute stress disorder will disappear or progress to PTSD,65 measures to prevent stress-related cardiovascular events are particularly important in the first one or two months after a disaster. Healthcare professionals should be aware of the fact that traumatic stress may cause physical problems, which are called general adaptation syndrome, before mental problems. Physicians who have not built a rapport (a close and harmonious relationship) with the victim yet should interview about physical problems due to the disaster rather than their mental problems, and make open questions to respond to victims who start to express their feelings. Victims who experienced a serious disaster and are living in a difficult condition with damaged infrastructures should be encouraged to feel free to ask for support. Providing websites and online bulletins that facilitate communication among disaster workers is useful to provide effective mental health and medical services for people affected by the disaster.66 Individuals who work to save and support victims in chaotic disaster situations tend to be exposed to significant stress as they feel strong social responsibilities. In fact, disaster workers have a higher incidence of mental health problems than disaster victims.67 Healthcare professionals and individuals who provide disaster support should share knowledge on the risk of disaster stress among disaster workers as part of individual or organizational preparation for future disasters. - As excessive mental and social stress is a major risk factor for disaster-related cardiovascular diseases both in disaster victims and workers, appropriate mental health care is essential for all those involved in the disaster. - Insomnia and increased blood pressure are important signs of mental health problems during the first one or two months after the occurrence of a disaster. Those with these signs should be treated carefully to prevent stress-related cardiovascular events. Important points in the basic concept for a successful disaster medical response. CSCATTT consists of four medical management factors (CSCA), and three medical support factors (TTT). In order to provide medical practice successfully at the affected area, CSCA systems must be established. CSCA consists of Command and Control (C), Safety (S), Communication (C), and Assessment (A). Command and Control means establishing well-organized command and control systems operated by empowered leaders. This is necessary to provide disaster relief activities immediately after the occurrence of a disaster. Safety means ensuring the safety of (1) Self (rescue workers), (2) Scene (condition of the affected area), and (3) Survivors. Communication means collecting and exchanging information necessary to provide appropriate medical care in the disaster setting. Assessment is made on collected information to prepare action policies and plans. When actions are made, further information should be collected to modify policies and plans to be deployed. By repeating these steps, medical systems that meet the changing needs of the affected area may be built. TTT means Triage, Treatment, and Transport, which are actions to be made at the scene. Triage is performed to utilize limited manpower and resources by assessing disaster victims in terms of the severity of their injuries and the necessity of emergency treatment to decide the priority of treatment and transport. Treatment means emergency treatment. Transferring casualties at the scene to the aid station for triage is prioritized. At the aid station, measures to stabilize vital signs are prioritized. Transport means transporting patients requiring treatment to appropriate medical institutions as soon as possible. After the Great East Japan Earthquake, the Health Policy Bureau of MHLW issued a notification entitled “Enhancing and Strengthening Disaster Medical Systems”,69 and indicated the following points to be emphasized to provide better medical care in the disaster setting in the future. Reports have indicated that natural disasters are associated with the increased risk of cardiovascular events. It is believed that disaster-related cardiovascular events are a major intrinsic cause of death in a disaster. Cardiologists may contribute to strengthening disaster medicine services by organizing in advance disaster response teams who will visit aid stations to prevent and detect the early occurrence of cardiovascular events, and creating a system to dispatch teams to affected areas without delay. 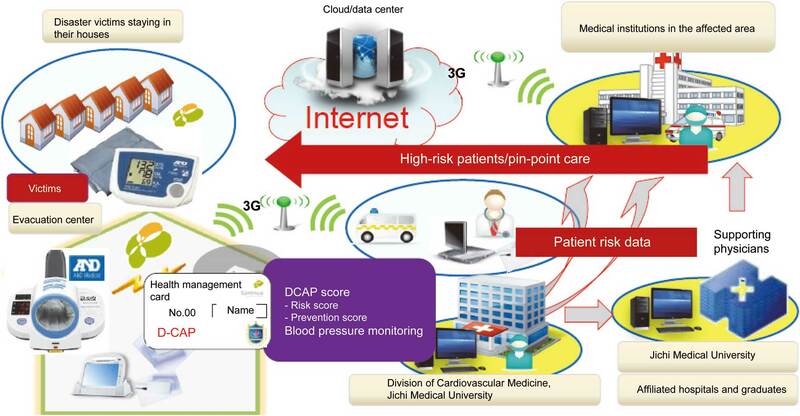 In the event of the Great East Japan Earthquake, the Disaster CArdiovascular Prevention network (DCAP Net) was run on a trial basis.45 The DCAP Net allows medical institutions in affected areas to work with disaster management base hospitals in remote areas to screen disaster victims using the DCAP Risk Score, manage data through cloud services, efficiently manage patients with a high risk for cardiovascular diseases, prevent the occurrence of disaster-related cardiovascular events, and support local medical institutions. Patients with cardiovascular disease should be instructed to keep two weeks’ worth of their prescription drugs, and patient pocketbook or medication booklet, which describes the history of disease and treatment as a measure to save their life in the event of a disaster. Cardiologists can perform these educational activities as the first step to build disaster-resistant healthcare systems. Companies are listed only by name. The following members have no COI to disclose. Members with no COI to disclose. 1. Suzuki S, Sakamoto S, Miki T, Matsuo T. Hanshin-Awaji earthquake and acute myocardial infarction. Lancet 1995; 345: 981. 2. Suzuki S, Sakamoto S, Koide M, Fujita H, Sakuramoto H, Kuroda T, et al. Hanshin-Awaji earthquake as a trigger for acute myocardial infarction. Am Heart J 1997; 134(5 Pt 1): 974–977. 3. Watanabe H, Kodama M, Okura Y, Aizawa Y, Tanabe N, Chinushi M, et al. Impact of earthquakes on Takotsubo cardiomyopathy. JAMA 2005; 294: 305–307. 4. Watanabe H, Kodama M, Tanabe N, Nakamura Y, Nagai T, Sato M, et al. Impact of earthquakes on risk for pulmonary embolism. Int J Cardiol 2008; 129: 152–154. 5. Aoki T, Fukumoto Y, Yasuda S, Sakata Y, Ito K, Takahashi J, et al. The Great East Japan Earthquake Disaster and cardiovascular diseases. Eur Heart J 2012; 33: 2796–2803. 6. Nakano M, Kondo M, Wakayama Y, Kawana A, Hasebe Y, Shafee MA, et al. Increased incidence of tachyarrhythmias and heart failure hospitalization in patients implanted with cardiac devices after the great East Japan earthquake disaster. Circ J 2012; 76: 1283–1285. 7. Nihei T, Takahashi J, Kikuchi Y, Takagi Y, Hao K, Tsuburaya R, et al. Enhanced Rho-kinase activity in patients with vasospastic angina after the Great East Japan Earthquake. Circ J 2012; 76: 2892–2894. 8. Aoki T, Takahashi J, Fukumoto Y, Yasuda S, Ito K, Miyata S, et al. Effect of the Great East Japan Earthquake Disaster on cardiovascular diseases: Report from the 10 hospitals in the disaster area. Circ J 2013; 77: 490–493. 9. Leor J, Poole WK, Kloner RA. Sudden cardiac death triggered by an earthquake. N Engl J Med 1996; 334: 413–419. 10. Satoh M, Kikuya M, Ohkubo T, Imai Y. Acute and subacute effects of the great East Japan earthquake on home blood pressure values. Hypertension 2011; 58: e193–e194, doi:10.1161/HYPERTENSIONAHA.111.184077. 11. Tsuchida M, Kawashiri MA, Teramoto R, Takata M, Sakata K, Omi W, et al. Impact of severe earthquake on the occurrence of acute coronary syndrome and stroke in a rural area of Japan. Circ J 2009; 73: 1243–1247. 12. Takakura R, Himeno S, Kanayama Y, Sonoda T, Kiriyama K, Furubayashi T, et al. Follow-up after the Hanshin-Awaji earthquake: Diverse influences on pneumonia, bronchial asthma, peptic ulcer and diabetes mellitus. Intern Med 1997; 36: 87–91. 13. Inoue Y, Fujino Y, Onodera M, Kikuchi S, Shozushima T, Ogino N, et al. Tsunami lung. J Anesth 2012; 26: 246–249. 14. Mittleman MA, Maclure M, Sherwood JB, Mulry RP, Tofler GH, Jacobs SC, et al. Triggering of acute myocardial infarction onset by episodes of anger: Determinants of Myocardial Infarction Onset Investigators. Circulation 1995; 92: 1720–1725. 15. Kark JD, Goldman S, Epstein L. Iraqi missile attacks on Israel: The association of mortality with a life-threatening stressor. JAMA 1995; 273: 1208–1210. 16. Steinberg JS, Arshad A, Kowalski M, Kukar A, Suma V, Vloka M, et al. Increased incidence of life-threatening ventricular arrhythmias in implantable defibrillator patients after the World Trade Center attack. J Am Coll Cardiol 2004; 44: 1261–1264. 17. Huang JL, Chiou CW, Ting CT, Chen YT, Chen SA. Sudden changes in heart rate variability during the 1999 Taiwan earthquake. Am J Cardiol 2001; 87: 245–248, A249. 18. Jouven X, Empana JP, Schwartz PJ, Desnos M, Courbon D, Ducimetière P. Heart-rate profile during exercise as a predictor of sudden death. N Engl J Med 2005; 352: 1951–1958. 19. Kario K, Matsuo T, Kobayashi H, Yamamoto K, Shimada K. Earthquake-induced potentiation of acute risk factors in hypertensive elderly patients: Possible triggering of cardiovascular events after a major earthquake. J Am Coll Cardiol 1997; 29: 926–933. 20. Jain D, Shaker SM, Burg M, Wackers FJ, Soufer R, Zaret BL. Effects of mental stress on left ventricular and peripheral vascular performance in patients with coronary artery disease. J Am Coll Cardiol 1998; 31: 1314–1322. 21. Yeung AC, Vekshtein VI, Krantz DS, Vita JA, Ryan TJ Jr, Ganz P, et al. The effect of atherosclerosis on the vasomotor response of coronary arteries to mental stress. N Engl J Med 1991; 325: 1551–1556. 22. Brown DL. Disparate effects of the 1989 Loma Prieta and 1994 Northridge earthquakes on hospital admissions for acute myocardial infarction: Importance of superimposition of triggers. Am Heart J 1999; 137: 830–836. 23. Kario K, Ohashi T. Increased coronary heart disease mortality after the Hanshin-Awaji earthquake among the older community on Awaji Island. Tsuna Medical Association. J Am Geriatr Soc 1997; 45: 610–613. 24. Reiter R, Swingen C, Moore L, Henry TD, Traverse JH. Circadian dependence of infarct size and left ventricular function after ST elevation myocardial infarction. Circ Res 2012; 110: 105–110. 25. Gerber Y, Jacobsen SJ, Killian JM, Weston SA, Roger VL. Seasonality and daily weather conditions in relation to myocardial infarction and sudden cardiac death in Olmsted County, Minnesota, 1979 to 2002. J Am Coll Cardiol 2006; 48: 287–292. 26. Trichopoulos D, Katsouyanni K, Zavitsanos X, Tzonou A, Dalla-Vorgia P. Psychological stress and fatal heart attack: The Athens (1981) earthquake natural experiment. Lancet 1983; 1: 441–444. 27. 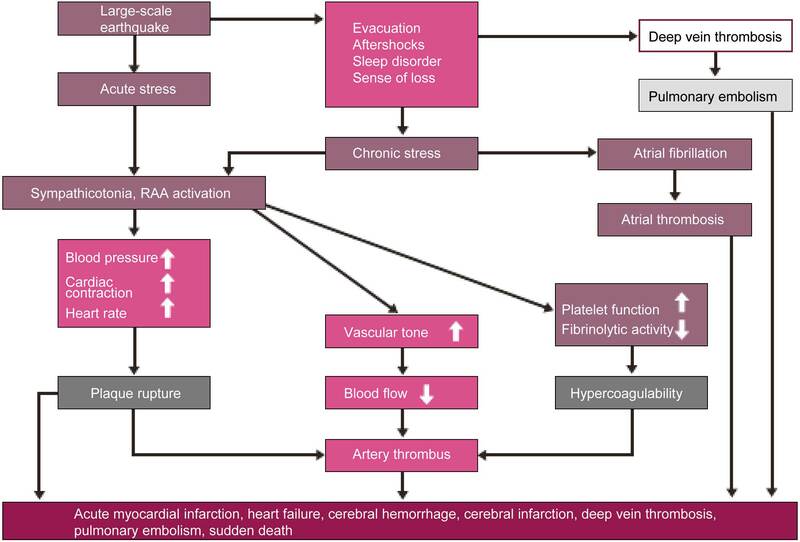 Hamer M, Molloy GJ, Stamatakis E. Psychological distress as a risk factor for cardiovascular events: Pathophysiological and behavioral mechanisms. J Am Coll Cardiol 2008; 52: 2156–2162. 28. Welfare and Health Promotion Division, Niigata Prefecture. Niigata Prefecture guidelines for nutrition and food support during disasters 2006. http://www.kenko-niigata.com/21/shishin/sonotakeikaku/saiigaijieiyou.html (in Japanese). 29. Welfare and Health Promotion Division, Niigata Prefecture. Niigata Prefecture guidelines for nutrition and food support during disasters, advanced edition in 2008. http://www.kenko-niigata.com/21/shishin/sonotakeikaku/jissennhenn.html (in Japanese). 30. Division of Health and Environment, Hyogo Prefecture. Guidelines for food and diet during disasters 1996. http://web.pref.hyogo.jp/hw13/hw13_000000039.html (in Japanese). 31. Bureau of Social Welfare and Public Health, Tokyo Metropolitan Government. Disaster control guidelines for mothers and young children. http://www.fukushihoken.metro.tokyo.jp/kodomo/shussan/nyuyoji/saitai_guideline.html (in Japanese). 33. Michaelsen KF, Clausen T. Inadequate supplies of potassium and magnesium in relief food: Implications and countermeasures. Lancet 1987; 1: 1421–1423. 34. Inui A, Kitaoka H, Majima M, Takamiya S, Uemoto M, Yonenaga C, et al. Effect of the Kobe earthquake on stress and glycemic control in patients with diabetes mellitus. Arch Intern Med 1998; 158: 274–278. 35. Mori K, Ugai K, Nonami Y, Kirimura T, Kondo C, Nakamura T, et al. Health needs of patients with chronic diseases who lived through the great Hanshin earthquake. Disaster Manag Response 2007; 5: 8–13. 36. Consumer Affairs Agency. 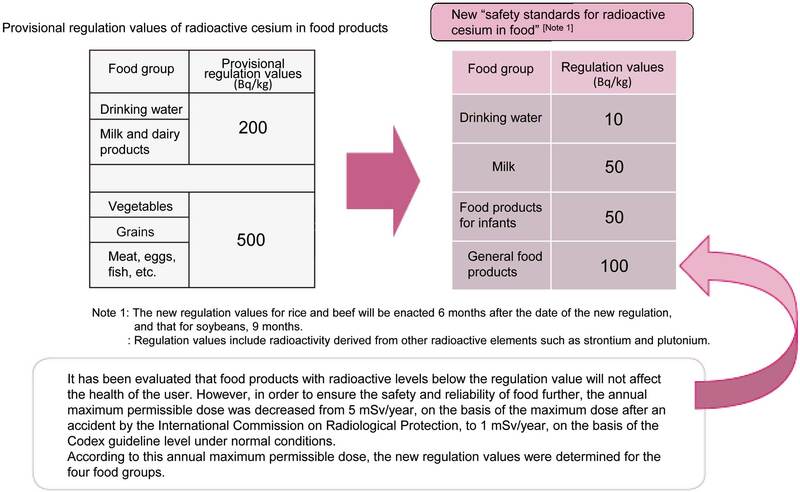 New regulation values of radioactive nuclides in food (March 15, 2012). http://www.caa.go.jp/jisin/pdf/120315_1.pdf (in Japanese). 37. Tanaka K, Nakayama M, Kanno M, Kimura H, Watanabe K, Hayashi Y, et al. Aftercare for the prevention of a secondary health disaster in survivors of major earthquakes. Hypertens Res 2013; 36: 759–761. 38. Kario K. Disaster hypertension: Its characteristics, mechanism, and management. Circ J 2012; 76: 553–562. 39. Writing Committee for the “Guidelines for initial disaster response and ambulance transport of elderly patients” granted by the MHLW for the Comprehensive Research on Aging and Health. Draft guidelines for disaster medicine for the elderly 2011, second edition: Prediction and assessment of medical needs in a disaster. Japanese Geriatrics Society, 2011: 185–189 (in Japanese). 40. Lacut K, Le Gal G, Couturaud F, Cornily G, Leroyer C, Mottier D, et al. Association between antipsychotic drugs, antidepressant drugs and venous thromboembolism: Results from the EDITH case-control study. Fundam Clin Pharmacol 2007; 21: 643–650. 41. Hanzawa K. Environment of evacuation facility and deep vein thrombosis in the Great East Japan Earthquake. Jpn J Clin Hematol 2012; 53: 246–252 (in Japanese). 42. Kario K, McEwen BS, Pickering TG. Disasters and the heart: A review of the effects of earthquake-induced stress on cardiovascular disease. Hypertens Res 2003; 26: 355–367. 43. Kario K, Shimada K, Takaku F. Management of cardiovascular risk in disaster: Jichi Medical School (JMS) Proposal 2004. JMAJ 2005; 48: 363–376. 44. Request for using the Disaster Cardiovascular Prevention Score in the Great East Japan Earthquake. http://www.carenet.com/disaster_medicine/disaster_hypertension/01.html (in Japanese). 45. Kario K, Nishizawa M, Hoshide S, Shimpo M, Ishibashi Y, Kunii O, et al. Development of a disaster cardiovascular prevention network. Lancet 2011; 378: 1125–1127. 46. Nishizawa M, Hoshide S, Shimpo M, Kario K. Disaster hypertension: Experience from the great East Japan earthquake of 2011. Curr Hypertens Rep 2012; 14: 375–381. 47. Kario K. Disaster hypertension. In: The Japanese College of Cardiology, editor. Disaster medicine handbook for cardiologists. Tokyo: Nihon Iji Shimpo, 2012: 124–127 (in Japanese). 48. Kario K. Proposal of a new strategy for ambulatory blood pressure profile-based management of resistant hypertension in the era of renal denervation. Hypertens Res 2013; 36: 478–484. 49. Kario K. Management of high casual blood pressure in a disaster situation: The 1995 Hanshin-Awaji earthquake. Am J Hypertens 1998; 11: 1138–1139. 50. Hirooka S, Sotoda Y, Orita H. Report on screening for deep vein thrombosis of east Japan great earthquake evacuees at shelter of Yamagata prefecture. The Japanese Journal of Phlebology 2012; 23: 7–10 (in Japanese). 51. Guidelines for management and treatment of sleep disorder, second edition. Uchiyama M, editor. Tokyo: Jiho; 2012 (in Japanese). 52. Uchiyama M. Epidemiology and basic understanding of insomnia. The Experiment & Therapy 2010; 698: 3–7 (in Japanese). 53. Understanding and care of mental trauma, second edition. Kim Y, editor. Tokyo: Jiho; 2006 (in Japanese). 54. Abe Y, Araki H, Iwai K, Kato H, Nagai N, Fujita M, et al. Guidelines on community mental health activities in the event of a disaster. Health Labor Sciences Research Grant 2001 (Health Labor Sciences Special Research Project): Report of the research on mental health support using a case study of a deadly incident in school. 2003 (in Japanese). 55. Bisson JI, Tavakoly B, Witteveen AB, Ajdukovic D, Jehel L, Johansen VJ, et al. TENTS guidelines: Development of post-disaster psychosocial care guidelines through a Delphi process. Br J Psychiatry 2010; 196: 69–74. 56. National Information Center of Disaster Mental Health website. http://saigaikokoro.ncnp.go.jp/ (in Japanese). 57. Ishii T. Entire record of disaster medical practice in Ishinomaki after the Great East Japan Earthquake. Tokyo: Kodansha; 2012 (in Japanese). 58. UNHCR Handbook for Emergencies, Japanese version. IV. Support to operations, Chapter 22 Coping with stress. Office of the United Nations High Commissioner for Refugees, 2000: 352–359 (in Japanese). 59. Guidance of Medical Service Division, Health Policy Bureau, Ministry of Health, Labor and Welfare. Disaster medicine. http://www.mhlw.go.jp/seisakunitsuite/bunya/kenkou_iryou/iryou/iryou_keikaku/dl/shiryou_a-4.pdf (in Japanese). 60. Nakayama H. Respiratory management in the event of the Great East Japan Earthquake: Home respiratory therapy in a major disaster. Lung Perspect 2011; 19: 388–391 (in Japanese). 61. Bureau of Social Welfare and Public Health, Tokyo Metropolitan Government. Guidelines for providing support for home ventilation patients in a disaster. March 2012. http://www.fukushihoken.metro.tokyo.jp/ (in Japanese). 62. Matsumoto T. Responses to home ventilation patients in the Great East Japan Earthquake. Jpn J Chest Dis 2012; 71: 232–242 (in Japanese). 63. Okumura T. Comment on survival card: To protect yourself, your family, your community and victims. The Journal of the Japanese Society of Internal Medicine 2010; 99: 1376–1378 (in Japanese). 64. Anan H. Very acute stage: The first two days. The Journal of the Japanese Society of Internal Medicine 2010; 99: 1711–1714. 65. Umezaki S, Shinchi K. Activities of a mental health care team in the Great East Japan Earthquake Disaster and future problems of the team. J. J. Disast. Med 2012; 17: 221–224 (in Japanese). 66. Abe H, Takeda R, Matsuo H, Nagatomo K, Kawano J, Watari M. Information and communication technology for mental health activity on large scale disaster. Japanese Journal of Clinical Psychiatry 2012; 41: 1345–1352 (in Japanese). 67. Shigemura J. Knowledge and techniques required to provide first-aid practice in hospitals and evacuation centers in disaster-affected areas (2): Mental health care for first-aid workers. Emergency Care 2012; 25: 272–273 (in Japanese). 68. Kitsuta Y, Sugiyama M. Major incident medical management in the United Kingdom. Journal of Japanese Association for Acute Medicine 2000; 11: 627–635 (in Japanese). 69. Health Policy Bureau, Ministry of Health, Labor and Welfare. Enhancing and Strengthening Disaster Medical Systems (Notification No. 0321-2 of the Health Policy Bureau, MHLW, dated March 21, 2012) (in Japanese).